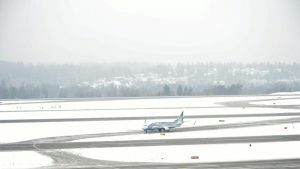 About 300 flights have been cancelled and around 150 more were delayed till Monday morning, Sea-Tac airport due to snow. The problem isn’t the runways as they are clear and fully operational. It’s all the fluttering snowflakes in the air. In such a situation, the aircrafts have to be farther apart from each other in the air, which reduces the amount of numbers you can bring in at any typical hour. On a clear, sunny summer day up to 50 aircraft an hour can come in, but with such low visibility on Monday morning, less than 20 planes could make it. Airlines are cancelling hundreds of flights ahead of time to thin the schedule and leave time for de-icing. Sea-Tac has a 99 people ‘snow team’ trained in snow removal and 25 mechanics standing by to make sure the equipment works. They are in charge of stocking supplies and the equipment works months ahead of winter. Sea-Tac has more than 45 pieces of equipment for snow, including four de-icing machines, three sander/plows, 10 high speed brooms and a lot of snow shovels. They also keep on-hand 300 tons of roadside sand and 350 tons of runway sand. Seattle-Tacoma International Airport has seen 14.1 inches of snow so far in February, which is twice the annual average and the snowiest month in more than 30 years.